We’d been there earlier in the month, and we wouldn’t usually have gone back again quite so soon. A half a sandwich and some fries is plenty enough for a meal; the second half sandwich is a meal for later. But February was an odd month. Instead of the usual “monthly special”, they had 4 different monthly specials, each one only for a few days. The last 5 days of the month were devoted to a bacon lover’s dream. 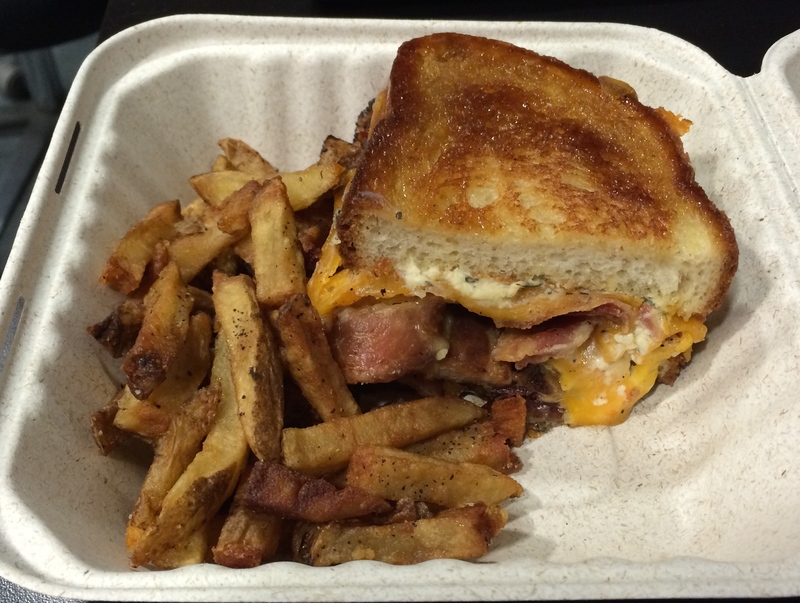 The sandwich was called “The 6 Degrees of Kevin Bacon Melt”. And yes, it had 6 types of bacon in it. Two types of cheese. Tomato and lettuce. All between two slices of thick bread. And then grilled. It was amazing. And perhaps the best part was that I had the second half to take to work with me. My new nephrologist told me 2 months ago that she was absolutely delighted that I’d brought her such an “interesting” puzzle to figure out. That means I got poked 4 separate times (including one arterial stick) for blood, had to fork over a kidney stone (don’t ask…please), and had to collect other unseemly such things as might help a kidney doc to figure things out. So I now have at least a partial diagnosis, a handful of horse pills to take every day, and the possibility that this may still end in a kidney biopsy to figure out just exactly what is going on. And my nephrologist is still enjoying figuring all of this out. My ENT is still trying to figure out exactly why the hearing in my left ear is not coming back. Sudden sensorineural hearing loss is most often temporary and generally is helped by steroids. When it is neither, it becomes “interesting”. Well, I’m almost 7 weeks out now from when I lost the hearing in that ear, and it’s not back. It’s not even coming back with the steroid shots (as thoroughly enjoyable as those are). That means more work-up to get it figured out and planning for a hearing aid. I’d really rather it just came back and I became one of the many who could hear just fine again. My new dermatologist also just today proclaimed me “very interesting”. She isn’t at all sure what is going on, other than to say that she doesn’t think the ER doc in Copenhagen was right. She has some ideas, but none of them fit with the ongoing recurrences, so she’s going to take a tiny piece of my thumb in a day or two, after letting the newest spot get a bit worse…just to be sure it’s bad enough that she can get a proper diagnosis, you see. I’m just going to keep my fingers crossed that it turns out to be something very common, very simple, very easy…that just looked ugly when it popped up. I’m thinking more and more that boring sounds just fine by me. So I was at the orthopedist today, getting my shoulder looked at. The good news is that surgery is not on the books. At least not yet. I am to change up the anti-inflammatory I am taking (to indocin…let’s hear it for tearing my stomach to shreds for the next two weeks), add in tylenol, and take vicodin only if -really- needed (as if I’d take it just for giggles *eyeroll*). Physical therapy is a “sort of” for the time being. Range of motion, definitely; strengthening, not so much yet. The doc compared my rotator cuff to a frayed rope. He said that the last thing I want is for any more of the fragile strands to break, lest the entire tendon just let go. Recheck in 2 weeks, and probably 2 weeks after that. Decisions on surgery or not to be made as time goes on. In the meantime, what am I allowed to do? Not much, really. Driving is to be avoided as much as possible, since it hurts and puts stress on the rotator cuff. And I am definitely not allowed to drive my little red car (with the manual transmission). So I’m stuck driving my truck. (Good thing I got the K&N air filter in a couple of weeks ago; I’ll take every extra mile/gallon I can tweak out of that beast right now…) Shooting? Ha. I probably should’ve known better than to even ask, but I did. I’m allowed to shoot lefty-only for now, nothing that puts weight or stress of any sort on that right shoulder. And most definitely no mountain biking, no horseback riding, and nothing else of anything even close to that sort of fun. Of course, after the doc heard what options I had in cars to drive, and then heard my questions about my free-time activities, he made a few pointed comments about “girls and their toys”…which only made me laugh. So I suppose that I really do have a cool orthopedist taking care of my shoulder, which is a good thing. And he knows that I’ll do whatever is necessary to get back to what I love doing, which is never a bad thing. I just want it to be ALL BETTER NOW!!! So on the way back from NEBS/GS, I managed to tear my rotator cuff. No, there’s not a good story to go with it…I’m simply that unlucky. Suffice it to say that I may never again eat at a Denny’s again without cringing. At least it’s my right arm, and I’m left-handed. But it’s nearly 0600, and I should’ve been asleep 2 hours ago. This doesn’t bode well for the weekend full of work, if I can’t get enough sleep the night before I start. I just can’t get comfortable enough when I try to lay down. Hopefully, physical therapy (to be started early next week) will help with this, and I can avoid surgery altogether. What’s really got me torqued off, though, is all the things I can’t do right now. I’ve got a new rifle on order, and I won’t be able to shoot it when it comes in. For that matter, I can’t do much shooting at all!!! Other than single-handed, that is…and I guess I’ll get much better at that over the next few weeks…maybe even months. There is no exercise program at the moment; no riding of my bike, and I can’t even begin to think of going back to Georgia to ride horses at the moment. I’m having to stop and gauge every single move before I make it, lest I end up on the floor, crying like a little girl…and that is JUST NOT WHO I AM. However, I do have a very sweet man taking very good care of me. He’s doing his very best to see that I don’t make things worse before I get better… And I do know just how lucky I am in that. Working out is working out! I’ve started working out again in my dungeon (aka down in the basement) to a set of DVDs. For the first time ever, I’ve found a workout video that I like. Yes, looking at that sentence makes me wonder a bit…but I haven’t skipped a day yet, and I’m 10 days in. I’m actually rearranging things in my day to be sure that I have the 40 or so minutes I need to spend on my workout. I’ve even gone downstairs at 11pm, and I -never- work out that late at night. There is no movement of the magic little slider button this week. At least not in the right direction. There may have even been a nudge in the improper direction, but I choose to ignore such movement for today and not ratchet it backwards. Last week, I was not good to myself. I allowed too many meetings to be added to my schedule (not really by choice, but still), so that I was chronically under-slept. I didn’t exercise because I was too tired and too ragged from running around to the meetings and to work. Work itself was not good, and being tired only made me less able to roll with the punches when bad shift piled on bad shift. And I wasn’t the least bit careful in my food choices. But that week is done and over. It’s past. And past bad behavior does not need to continue. I’ve already gone and worked out today, and I’m lining up better foods for the week. A minor blip is not failure, and I won’t let it become that. It’s been one week since I made the commitment to myself to lose weight, and to do it for me this time. So what have I done in a week? — Eating a little bit healthier. — Heading to the gym to re-up my membership this afternoon. — 2 1/2 pounds gone.